At WordCamp Victoria a couple of weeks ago, I attended a session led by Beth Cougler Blom on the topic of Genuine Blogging. She touched on some pretty serious issues regarding the personal nature of blogging, including the fears, the challenges and the consequences that bloggers have to face every day. Should I Use My Real Name or Blog Anonymously? Real name. You have to own what you say. Most first-time bloggers have a backwards way of thinking: They’re terrified of putting their lives online, so they choose a pseudonym and let loose. Right from the get-go, their blogs are packed with intimate details of their life, health, work, family, whatever. It doesn’t matter, because no one knows who they are. Like I said, that’s backwards. Rather than revealing details you’re uncomfortable owning up to, why not use your real name from day 1 and only say what feels right? That way, you’ll naturally find your boundaries and you’ll never have to go back and delete things you regret. Your blog will be you—the true you—and you will be a better person and a better writer because of it. Should I Let People Comment on My Blog? They Can Be Mean. Yes. Comments make you tough. Here’s the thing: You’re blogging for an audience. No one likes to feel like their life is being judged or ripped apart, but it’s going to happen. The majority of comments will be helpful and community-building, but there’s always going to be someone who thinks they know you better than you know yourself. The trick is weeding out the spam and mean-for-the-sake-of-being-mean comments and finding value in what’s left. If someone twists your words and disagrees with a point of view you never had, maybe your writing isn’t clear enough. If someone criticizes your grammar, maybe you should finally learn how to use semi-colons. And if someone questions your choices in life, maybe you should take a minute and think about what else you could have done. Either you’ll recognize your fault and make a better decision next time, or realize that yes, what you did was right. Should I blog about my family? Or work? Only in a positive, respectful way. The internet isn’t the place for family drama or stories about how much you hate your job. If you wouldn’t say it to their face, don’t say it online. 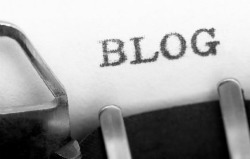 Blogs shouldn’t ruin relationships. Also, keep in mind that when you signed up to put your life online, you didn’t also sign up your parents, your spouse, your children, your friends and your coworkers. Be careful of how you include them—even positive mentions make some people uncomfortable—and if you have any doubt, ask for permission. Some might want you to change their names and some might not want to be included at all, but that’s fine. It’s not up to you. And just because your blog doesn’t contain every single aspect of your life doesn’t mean it’s not authentic. It means you’re staying true to the people close to you and what you believe is right, and it doesn’t get more genuine than that.